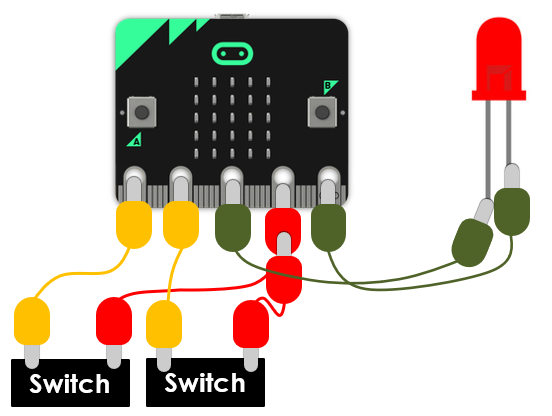 In a previous post I presented a practical logic gates lesson using the BBC micro:bit, however it required quite a lot of setup and didn’t involve the students in programming the micro:bits. The original post can be found here. In this updated version I present a simplified version of the lesson aimed at KS3 students, however it would also be suitable for GCSE. In the lesson students are given the program for a NOT gate, they are asked to investigate the program and build a logic circuit to test it. In the next task the students adapt the program to create AND and OR gates, they then use their programmed micro:bits to build logic circuits that aid them in the completion of truth tables. Students will also need access to the starter program and the PowerPoint Workbook, which details all the activities. In this lesson the students program the micro:bits using Python, they can either use the micro:bit website or the offline Mu editor. Please note you could use battery packs to power the micro:bit for this set of activities, however when you want to start joining multiple gates together later on, the micro:bits will need to be grounded and easiest way to do this is to power them via USB. I will be following up this post with a more advanced activity aimed at GCSE students. May I know which tool you are using to draw the micro:bit circuit diagram above?